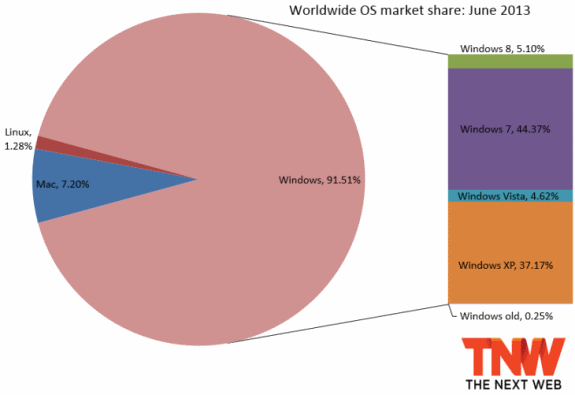 The latest marketshare data from Net Applications reveals that Windows 8 is now finally more popular than Windows Vista. The operating system's marketshare rose a staggering 0.83 percent to 5.10 percent, while Windows 7 saw its use decline by 0.48 percent to 44.37 percent. Windows XP still stands strong with a marketshare of 37.17 percent, while Windows Vista clings onto 4.62 percent. Windows 8 is still far from popular, but the good news for Microsoft is that the adoption rate of the new OS seems to be picking up. The 0.83 percent marketshare increase is Windows 8's largest yet this year, the operating system grabbed 0.66 percent in December 2012, followed by five months of smaller gains. This month’s big jump might be because of Windows 8.1, the next version of Microsoft’s operating system, which will be a free update for Windows 8 users available via the Window Store. Many were likely interested in giving the free preview Microsoft gave away at its Build 2013 conference last week, so they chose to finally get Windows 8. Our thoughts on the new version are here. In January, Windows 7 lost market share for the first time since its release, just a month after passing the 45 percent mark. It’s hovering just below that mark now, and we continue to believe it will never reach it again.